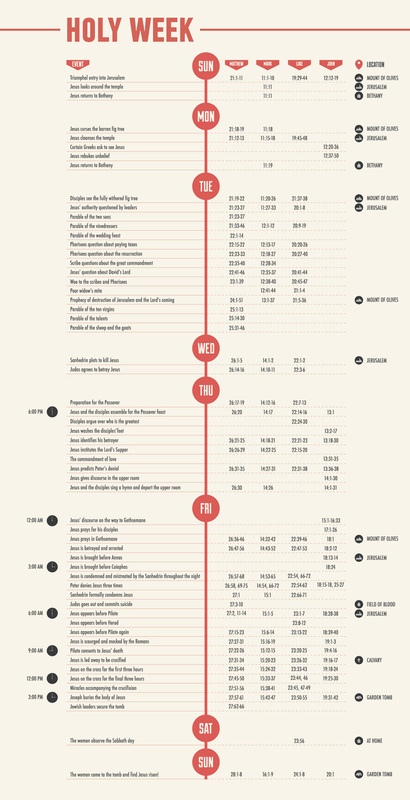 Looking for a Historical Holy Week Timeline? As we enter into Holy Week, the Synoptic Gospels (Matthew, Mark and Luke) provide a timeline for the Passion. It is true that the Gospel of John provides a different timeline, which recent scholarship and archeology lend greater support for, but we have traditionally used the synoptics to inform us for nearly two thousand years. And, to be honest, the timeline is plausible – though rushed – and is what is understood in our cultural narrative. Therefore, read the Gospel chronology as a likely historical accompaniment of the Passion. More importantly, as we enter this week, let’s join Jesus each day and walk with Him.